USA: Campbell (Harris, min. 67); Sonnett, Sauerbrunn, Davidson, Dunn; Brian (Long, min. 29), Horan (Hanson, min 40), Lloyd; Pugh, Morgan, Rapinoe. Mexico: Santiago; Robles, Sierra, Espinoza (Flores, min. 50), Murillo (Mejia, min. 46); Ocampo, Mayor, Ferral (Flores, min. 78), Niet; Palacios (Cuellar, min 74), Calderon (Guajardo, min. 70). Thank you for joining VAVEL USA for the live coverage of USA vs Mexico. Join us for the next match! This is Bianca Verar, signing off! 77' - Chaos in front of Santiago, but US can't come out with a goal! 76' - Morgan almost gets a hat trick, but it's just wide of the post! A few years ago, Huerta was playing for Mexico in this match up. Today, she plays for the USA. 68' - GOAL USA! Alex Morgan on the end of Rapinoe's corner! 64' - USA GOAL! Keeper is flying out and the rebound falls to Rapinoe, who hits it nicely into the goal! 43' - Hanson getting in on the action. She played a ball for Long, but it's a little too much. Hanson earns her first cap for the US! 34' - USA GOAL! HISTORY MADE as Carli Lloyd heads in her 100th goal for the US! 25' - USA GOAL! Horan equalizes with a header! 24' - GOAL MEXICO! Mexico take the lead off another corner! Headed in by Kiana Palacios! 17' - MEXICO GOAL! They take advantage of the corner, curling it in past Campbell! 3' - GOAL USA! Mallory Pugh streaks down the field, stepping past the keeper and putting it away! Lineups and anthem are done, we're ready for kick off! Houston Dash midfielder Haley Hanson is listed as a sub for this match as well. USWNT goalkeeper Jane Campbell earns the start in her NWSL home stadium. Mexico Goalkeeper Bianca Henninger is available as a sub. Mexico Starting XI: Santiago; Robles, Sierra, Espinoz, Murillo; Ocampo, Mayor, Ferral, Niet; Palacios, Calderon. USWNT Starting XI: Campbell; Sonnett, Sauerbrunn, Davidson, Dunn; Brian, Horan, Lloyd; Pugh, Morgan, Rapinoe. There is plenty ahead for the US vs Mexico. Make sure you’re still following along here on VAVEL USA for the latest updates and live commentary for the match. A few players on both US and Mexico will experience a sort of “homecoming” in Houston. BBVA Compass Stadium, home of the Houston Dash, provides a home field to goalkeeper Jane Campbell and rookie midfielder Haley Hanson of the US and goalkeeper Bianca Henninger of Mexico. Henninger started in goal for Mexico last match, but Campbell and Hanson did not make appearances. Campbell was listed a substitution last game while Hanson did not suit up. Morgan’s performance on Thursday night gave fans nostalgia of the 2012 Alex Morgan. The forward has dipped up and down since then, many of her problems stemming from injuries every now and then over the past few years, but if last game was any indication, Alex Morgan is about to have a stellar 2018. It will be interesting to see what head coach Jill Ellis puts on the field of the US today. She’s been trying plenty of people in lots of different positions, and started the USWNT in a three back - once again - on Thursday. Ellis hasn’t found her perfect mix of players for the upcoming qualifying tournament in October, and a lot of that has to do with injuries, but time is slowly running out for Ellis if she wants to get all the pieces to click before then. The US may have shined in their performance on Thursday, but today is a whole new game. Mexico has been able to prove a tough opponent every now and then, most recently in 2016 when they only held the US to a 1-0 scoreline for the 2016 Olympic Qualifying. Their attack was even able to pull through on Thursday, when Sky Blue FC’s Katie Johnson put one past an onrushing Alyssa Naeher to get one back for Mexico. The USWNT’s victory also included a goal from Mallory Pugh and midfielder Carli Lloyd’s 99th goal. She very well could score her 100th goal for the red, white, and blue today at BBVA Compass Stadium, home of her former club the Houston Dash. This is the second friendly the USA will play against Mexico this week. The first one occurred on Thursday night in Jacksonville, Florida. The USWNT dominated the game, taking a 4-1 victory over Mexico which include two goals by forward Alex Morgan. Morgan went on a five-minute spree, first earning a corner kick and slotting it away and then putting another goal away from an impossibly tight angle. 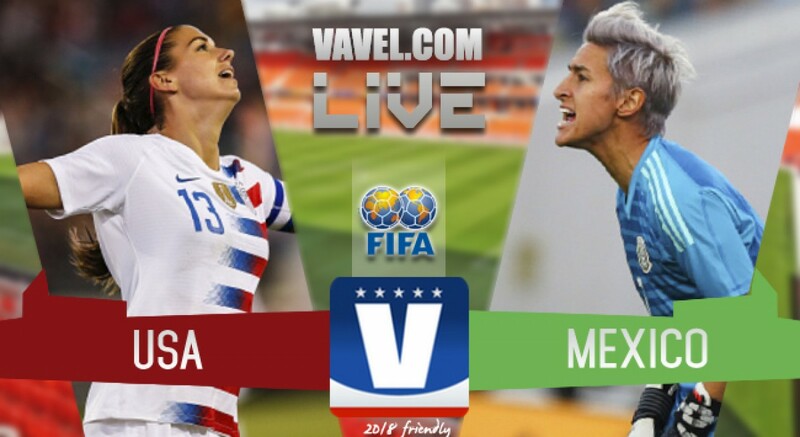 Welcome to VAVEL USA’s LIVE coverage of the 2018 FIFA Friendly match between the US Women’s National Team and Mexico. My name is Bianca Verar and I’ll be your host for this game. We will provide you with pre-game analysis, roster updates, and news as it happens here on VAVEL. This game will be broadcasted on Fox.